Gail Hobbs-Page received her first pair of goats as a child growing up on a North Carolina farm. “I loved their milk, and I loved the idea that I could make many things from their milk.” Today, Gail and her husband own Caromont Farm in Esmont, Virginia, tucked away in the rolling hills of the Piedmont, where Gail produces farmstead, artisan cheeses from her herd of Alpine, La Mancha and Saanen goats. Caromont Farm also produces cow’s milk cheeses from nearby grass fed Silky Cow Farm. She speaks passionately about the potential for Virginia terroir — a wine making term meaning the expression of place through flavor. 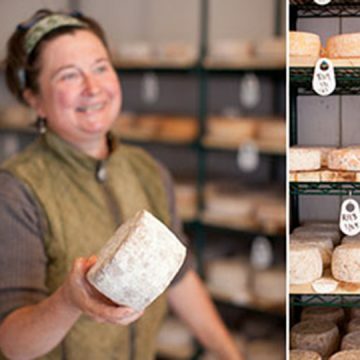 While cheese making has been an important method of cold storage since Virginia’s colonial period, the making of artisan cheeses is relatively new to Virginia, with Gail leading the way.